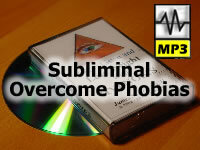 Overcome Phobias!... this program allows you to obtain a relaxed tranquil mind set where you can program yourself for positive changes in your life. You hear only the sounds of the surf and ocean waves. Hidden beneath these sounds are specially designed messages. Only your unconscious mind hears these healthy and powerful messages and turns them into positive feelings and improved determination to help you to accomplish your goals. Listen to the soothing suggestive therapy once a day for at least 20 days - Just relax and listen, what could be easier?